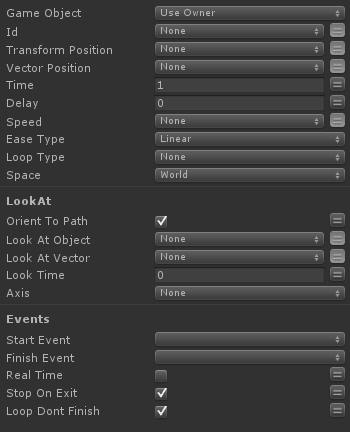 Instantly changes a GameObject's position to a supplied destination then returns it to it's starting position over time. Move From a transform rotation. The position the GameObject will animate from. If Transform Position is defined this is used as a local offset. Move in World or Local space. Whether or not the GameObject will orient to its direction of travel. False by default. A target object the GameObject will look at. A target position the GameObject will look at. Last modified on 5/9/2011 8:40 PM by User.